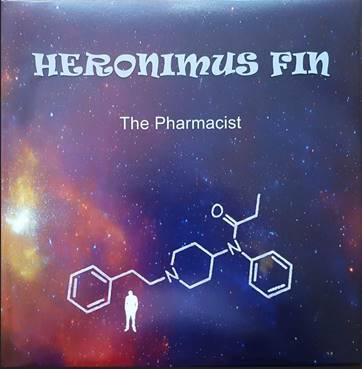 Heronimus Fin, the 60’s and 70’s-saturated underground rockers, release their new album on 20th August and with it introduce a heavier side to the band. After four albums of hugely acclaimed psychedelic and folk adventures, they present ‘The Pharmacist’, a concept album following the tragic life of an individual addicted to prescription drugs. Still with regular flashes of their typically English eccentricities and patchouli-psych, their sound is now fleshed out with monolithic Sabbath-esque riffs: part psych; part prog; part cosmic rock, Heronimus Fin are a band who are as timeless as they are inventive. Regularly featuring highly in Record Collector Magazine’s list of the 500 Most Collectible Artists (outstripping everyone from Roger Waters to The White Stripes), it will come as no surprise that Heronimus Fin have once again pulled out all the stops with the physical release of their album. Limited to a miserly fifty copies worldwide is the glitter-effect cassette, with even fewer signed copies of the deluxe vinyl version due to become the prized possession of only twenty fans – perhaps the most limited-edition release of the year! The vinyl copy is a tour de force, a gatefold sleeve housed in a specially printed PVC sleeve, not to mention full-colour poster, lyric sheet, “side-effects advice sheet” and something even more unique which is still being kept under wraps. ‘The Pharmacist’ is a concept album which really delivers both musically and in terms of the narrative. Bringing the subject of drug addiction bang up to date without preaching or a hidden agenda, it’s an album to whack on your headphones to or turn the dial up high enough to annoy the neighbours across the road. Co-produced by John Rivers (The Specials’ “Ghost Town”; Ocean Colour Scene) at Woodbine Studios, Heronimus Fin have cemented their place as one of England’s most enigmatic rock bands, one with a sound and a message which leans as much on the past as issues and trends of the present and future. Your cure for bored ears is Heronimus Fin.